Easter Sunday in 2019 is on April 21. 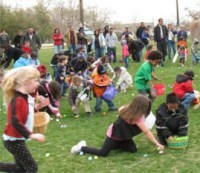 Enjoy Easter weekend with family and kids by attending one of the Easter egg hunt events happening all around the Truckee Meadows and nearby places. Note that most of them are on Saturday, April 20, so plan accordingly. They are also free. Should you be up at north Lake Tahoe or down in Carson City for Easter weekend, you will find a nice selection of Easter egg hunts to enjoy with the family. Before heading out, check the weather forecast just in case since Easter egg hunts are outside. Spring is here and chances are it will be a nice time to enjoy being out and about in the Reno / Tahoe area. Easter Sunday Brunch / Dining – Some really nice Easter Sunday dining is available in the Reno / Sparks area on April 21, making for an enjoyable way to top off all that Easter egg hunting and candy eating. Some of the casinos will have big buffets with lots of choices. Many of these will be open during brunch hours, from morning through the afternoon. Some others, both in casinos and at independent restaurants, will be serving into the evening for a dinner meal. Go to “Easter Dining in Reno and Sparks” to see who is serving and where. Mt. Rose Ski Tahoe: April 28. Squaw Valley: July 7. Seven-day operations through May 27, then Fridays through Sundays through July 7. Alpine Meadows: into May, depending on conditions. Kirkwood: April 14, with an additional weekend of operations from April 19-21. Donner Ski Ranch: April 28. Unfortunately, the annual Reno Earth Day celebration will not be held in 2019. According to the website, organizers plan to bring it back bigger and better in 2020. Meanwhile, up in the north Lake Tahoe area, you can enjoy Tahoe Truckee Earth Day on Saturday, April 20, 2019, at the Village at Squaw Valley. At the other end of the lake, South Tahoe Earth Day is scheduled for Saturday, April 27, 2019, at Bijou Community Park in South Lake Tahoe. More information about both of these events is available from my Earth Day article.